Montreal. Printed and Published by John Lovell. 1860.. Hardcover. 33.5cm, folio. 36p. engraved frontis title-page, map, and 13 lithographed plates, in the original blind stamped cloth, with gilt titles on the upper cover, expertly restored, some foxing or damp spots mainly on the margins of the first four plates, the last plate has a small closed 3cm tear (expertly repaired), the illustrations are good clear strikes. (cgc) T.P.L. 5907. Lande 1863. Spendlove p44-45. Sabin 33936. Harper p167. 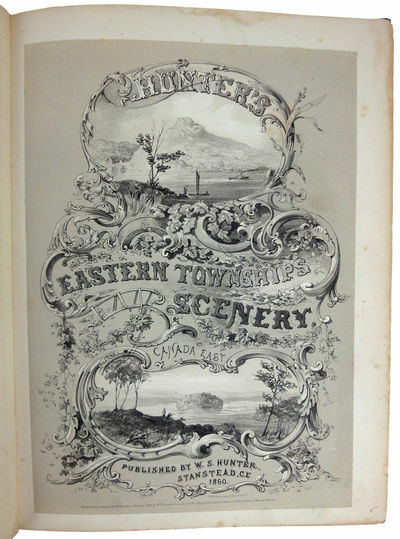 "As the text indicates, Hunter lived in Stanstead, in the Eastern Townships, and so could describe and illustrate this distinct and very beautiful part of the Province of Quebec from personal knowledge. The plates were accurately drawn and lithographed, and are of much interest and increasing rarity. They were printed in black and white, and sometimes later given a wash of light colour. Lithographed by Bufford in Boston who did so many early views for Nathaniel Currier". Spendlove. The plates are oval shaped with interesting small separately titled vignette illustrations at the corners. These attractive antique lithograph views portray this scenic area of Quebec in the mid-nineteenth century. The map indicates the railway connections to the eastern townships. .